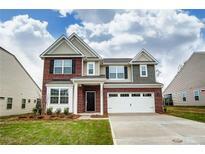 Find Waxhaw, NC New Homes for sale. View Photos, Maps and MLS Data Now! Many custom features - this home is built to impress! Corner homesite. MLS#3497733. DR Horton Inc.
Visit Millbridge's award winning amenities featuring Community House, pools with slides and lazy river, play ground, airnasium, state of the art fitness center and full time Activity Director! MLS#3497557. Lennar Sales Corp. This home will not last on the market! MLS#3496754. Lennar Sales Corp.
Rare ranch plan in the highly amenitized - award winning Millbridge community - Home will include granite counter tops in the kitchen and all the baths, tile back splash & stainless appliances in the kitchen; extensive moldings throughout the home; hardwood floors in the entry hall, kitchen and informal area; front and rear covered porches. MLS#3497722. DR Horton Inc.
Cortona’s Amenities to be completed in 2019: luxurious clubhouse w/ event space and fitness room, patio w/ fireplace and more. Highly rated Cuthbertson school district. MLS#3495018. Carolina Realty Solutions. MillBridge - Millbridge is the only Waxhaw community with a full time Activity Director! MLS#3495724. Lennar Sales Corp.
MillBridge has resort style amenities and a full time activity director on site! MLS#3495735. Lennar Sales Corp.
MillBridge - North Carolina Community of the Year 2017! MLS#3494831. Lennar Sales Corp.
Come see the Linnane Homes difference. MLS#3491909. RE/MAX Executive. Secondary bedrooms offer ample closet space. Flexible loft. MLS#3493128. CCNC Realty Group LLC. Additional full bath upstairs and plentiful natural light throughout. MLS#3493434. CCNC Realty Group LLC. Close to shopping,schools, entertainment and recreation. MLS#3491824. CCNC Realty Group LLC. Impressive foyer entry leading open kitchen/ breakfast + family room. MLS#3492972. DR Horton Inc.
Home will include granite counter tops in the kitchen and all the baths, tile back splash & stainless appliances in the kitchen; extensive moldings throughout the home; hardwood floors in the entry hall and kitchen; front and rear covered porches! MLS#3492986. DR Horton Inc.
MillBridge - Millbridge is the only Waxhaw community with a full time Activity Director! MLS#3492672. Lennar Sales Corp. Window treatments and attached lighting will convey. MLS#3492267. Pulte Home Corporation. Impressive foyer entry leading open kitchen/breakfast + family room. MLS#3489816. DR Horton Inc.
Two additional secondary bedrooms and flexible loft on second level. MLS#3489683. CCNC Realty Group LLC. Our homes are nicely appointed with elegant trim package, hardwoods, granite, tile, large master, much more! MLS#3488904. DR Horton Inc. Impressive foyer entry leading open kitchen/breakfast + family room. MLS#3489642. DR Horton Inc. Impressive foyer entry leading open kitchen/breakfast + family room. MLS#3489620. DR Horton Inc.
All nestled in the charm of Waxhaw minutes from downtown and convenient to Weddington! MLS#3488579. TLS Realty LLC. MillBridge has resort style amenities and a full time activity director on site! MLS#3488900. Lennar Sales Corp.
Split bedroom plan offers three additional bedrooms apart from the owner's suite. MLS#3489141. CCNC Realty Group LLC. Visit Millbridge's award winning amenities featuring Community House, pools with slides and lazy river, play ground, airnasium, state of the art fitness center and full time Activity Director! MLS#3488887. Lennar Sales Corp.